Fears of a recession loomed larger last week after the chairman of the President's Council of Economic Advisors, Kevin Hassett, doubled his estimate of the damage the U.S. economy will suffer from the partial shutdown of the federal government. He was widely quoted across the media as saying first-quarter growth of the economy could stall to zero. 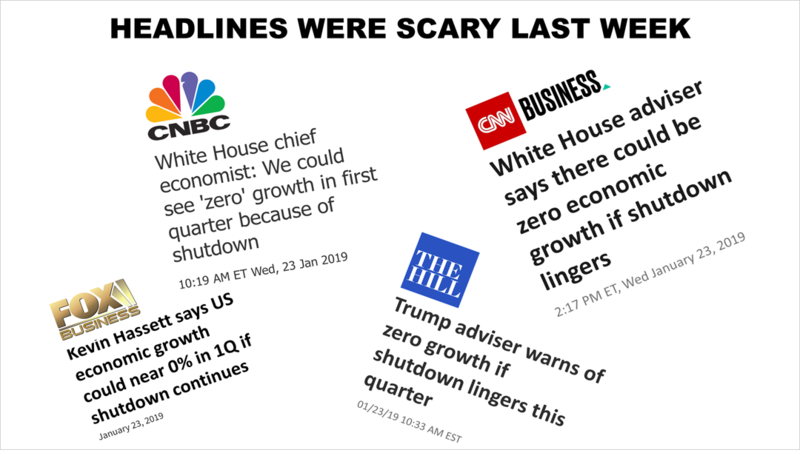 On Friday, the shutdown uncertainty was resolved, at least for now, and new data indicated the headlines were much more ominous than the current economic facts. 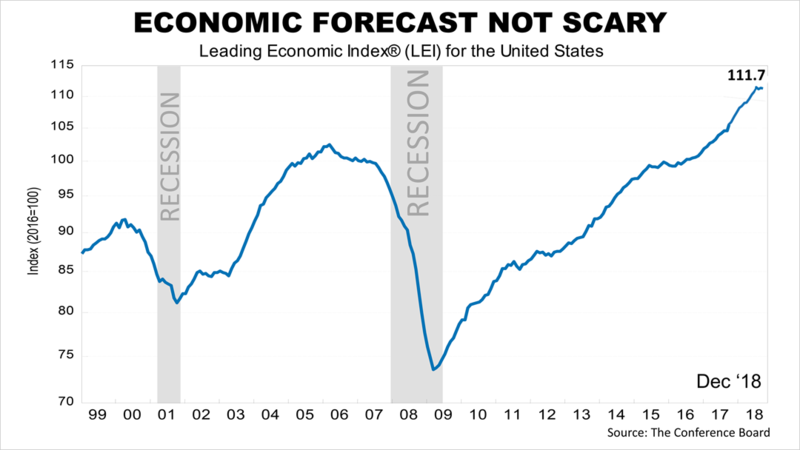 The newly released index of leading economic indicators indeed declined a tenth of 1% in December, following November's increase of two-tenths of 1%, and the outlook for slower growth in 2019 became more likely, according to the Conference Board economists responsible for tracking LEI's 10 sub-indexes, but their forecast for decelerating growth was nothing like the frightening scenario about the impact of the shutdown that was featured in breaking news headlines last week. "The US LEI declined slightly in December and the recent moderation in the LEI suggests that the US economic growth rate may slow down this year," said Ataman Ozyildirim, Director of Economic Research at The Conference Board. "While the effects of the government shutdown are not yet reflected here, the LEI suggests that the economy could decelerate towards 2% growth by the end of 2019." The 2% forecast for 2019 is slightly lower than the 2.3% average growth rate projected in early January by 60 economists in The Wall Street Journal, but slow-growth is not no-growth, and it does not mean a recession — back-to-back quarters of shrinking of GDP — is going to occur. Stocks drifted lower in the holiday-shortened trading week but on Friday surged nearly 1% after a deal was reached to end the shutdown temporarily. The Standard & Poor's 500 — a key growth component in a broadly diversified portfolio — closed on Friday at 2,664.76, compared with 2,670.71 a week earlier. The market suffered a 19.8% plunge from September 20th's all-time closing high to the Christmas Eve closing low of 2,351.10.